At her tender age, health screens will be forthcoming as she matures. She will be screened in accordance with AKC/ABC Breeder of Merit Requirements. 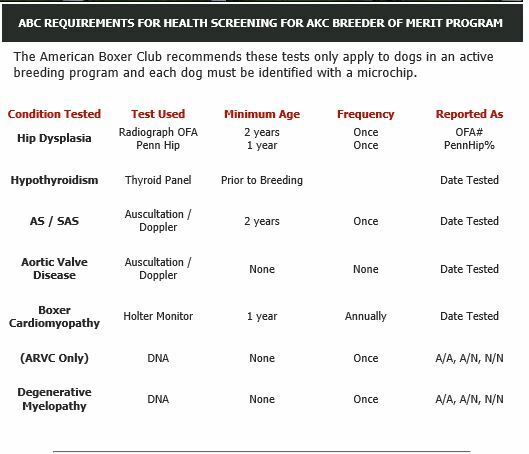 In order to maintain Breeder of Merit requirements, both the AKC and ABC require these screens listed below, as confirmed by AKC's Breeder of Merit program administrator. These are not "recommendations". 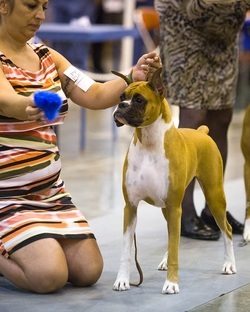 They are requirements confirmed also by the American Boxer Club. 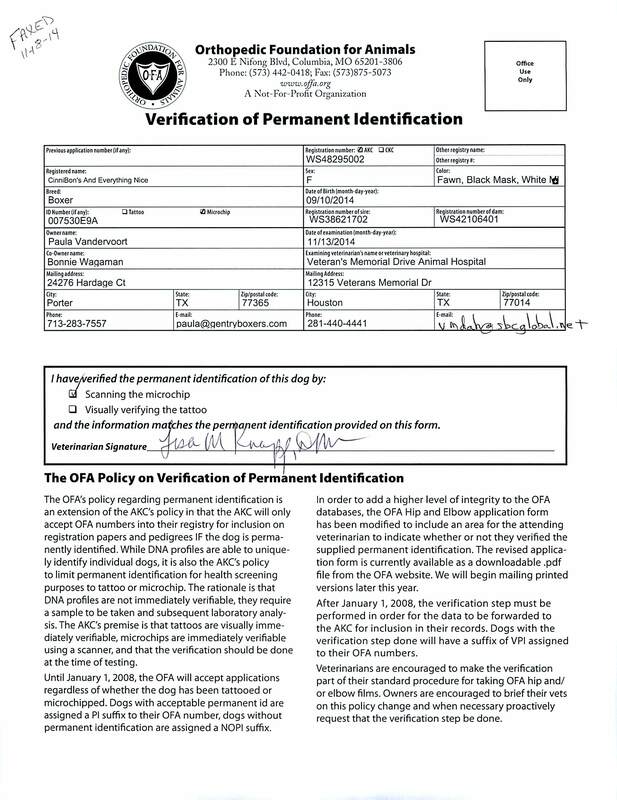 Screenings will be listed below and published to the OFA site with Verification of Permanent ID, a requirement imposed by AKC for screens to be included in the AKC database. Her Permanent ID is already in place. 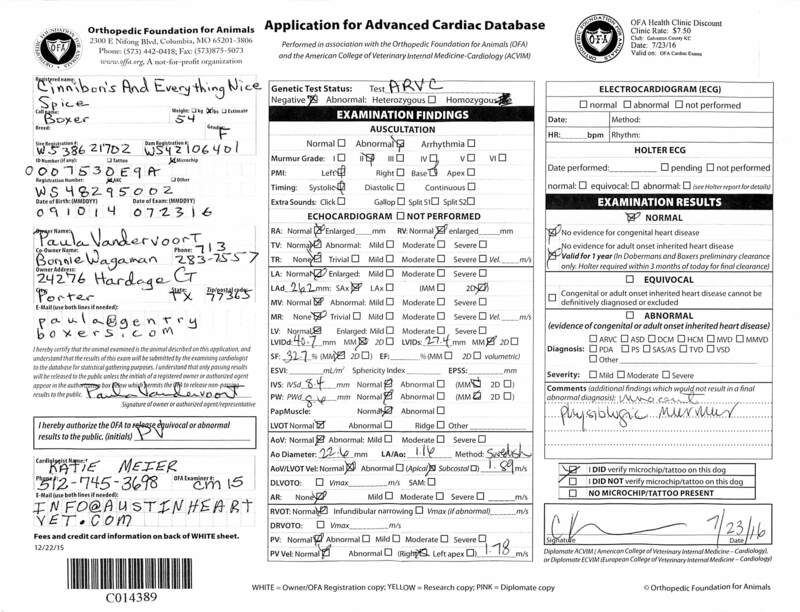 She is DM heterozygous and ARVC clear. In addition, she will have period screens of her eyes by a board certified ophthalmologist for all inherited eye conditions including corneal dystrophy, regular thyroid screens, routine titers and heartworm antigens. She is a naturally reared puppy whose immune system is being supported by natural means and is not traditionally vaccinated. She is raw fed, receives GreenMin, Soul Food, Echinacea, GutSense, wild Salmon oil, and tripe. 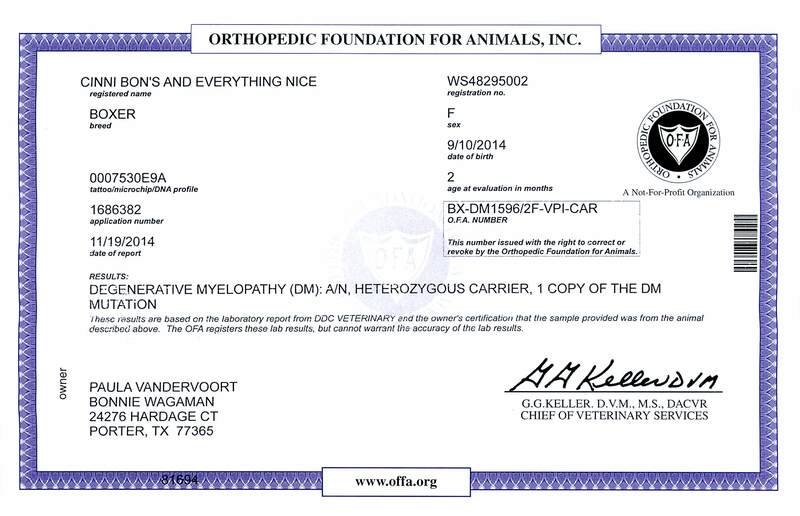 She is supported by several holistic veterinarians including a local hospital in Houston, Veteran's Memorial Animal Hospital. We routinely use veterinary chiropractic, acupuncture, and homeopathic supports when appropriate. We screen doggie microbiomes through the AnimalBiome Project. Spice was determined to have such healthy gut microbiome that she redefined the data points for naturally reared dogs. 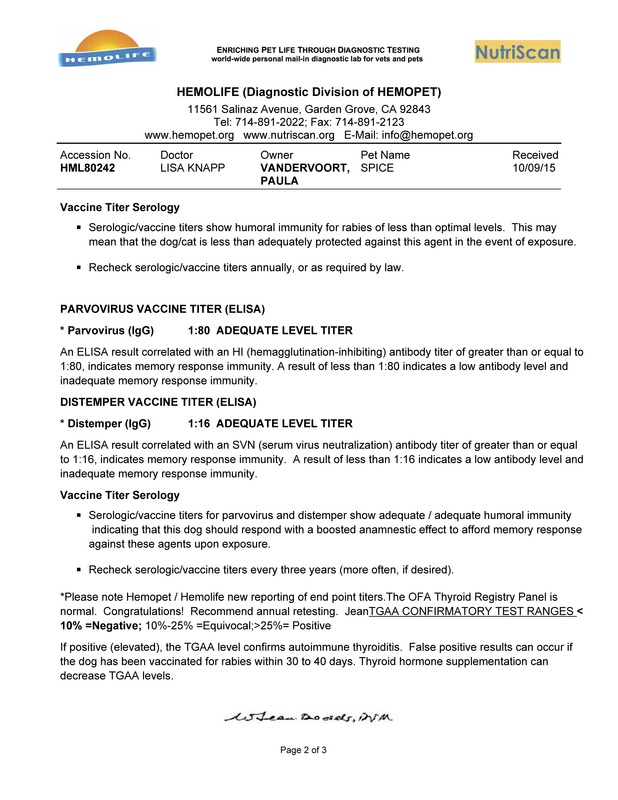 She is a donor through the AnimalBiome Project. Her "poo" contains the healthy gut bacteria missing in so many dogs who have been exposed to antibiotics, kibble diets, toxins, and poor epigenetic influences. She is saving lives and we are proud to be a part of this project.